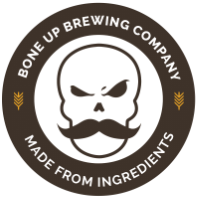 Stats: Galena - Bone Up Brewing Co.
Color: A shimmering, ethereal gold, not unlike the sun rising to shed light upon two raccoons fighting over an old grilled cheese or something I don't know. Cheese Pairing: White American, eaten straight out of the deli package as you stand there in your bathrobe with the fridge door still open. Best Occasion to Drink: While knitting. Brewers' Notes: We love us some hoppy saisons around here and we also love us some Galena so it was frankly kind of confusing to us that we hadn't yet combined the two. But we fixed that! Fixed it real good.